The Monarchs are on the move! On Saturday, at Family and Friends weekend at Erie Beach campground, the trees were laden with Monarch butterflies, clinging, resting, and probably waiting out the wind blowing from the wrong direction. By Sunday morning, they were on their way, and from the auditorium window, we could watch as butterfly after butterfly flew past, heading out over the lake. In the afternoon, I couldn’t help but notice how many monarchs were visibe flying down the 401 corridor, perhaps heading towards the very place from whence we had just come. Somehow it seems appropriate that they choose this place to rest before the next step on their long, long journey. This is a place that we humans look to in order to accumulate the strength to continue our own life’s journey. Like the butterflies, we come here to rest under the trees, to gaze out over the water, to gain spiritual and physical nourishment, and to flex our metaphorical wings. But there is another, perhaps less obvious parallel between us and the butterflies that come to this place. It is here, or to places like this one, that we bring our children and grandchildren so they too can be fed and nourished. It is here that the hope is expressed over and over again that our children will continue to bring their children for generations to come, so they too can experience that special bond with the grounds and the Spirit we experience here. This tradition has now continues for over 100 years, and many generations. But the pattern is even more dramatically illustrated in the experience of the Monarchs; the only species of butterfly that undertakes the the long migration from Canada and Northern USA to Mexico and back every year. The truth is that the butterflies who leave here this fall have never rested here before, but their ancestors have. Further more, they will never come again, although their descendants will. In fact, when the Monarchs return next summer, it will probably be the great, great, grandchildren of those we watched fly away this fall. Yet somehow they remember where to come. Whether the co-habitation of this sacred space by these two species is an accidental or deliberate blessing makes no difference to me. The fact is that we share this space, and we know we are blessed both by God’s grace and by the graceful presence of God’s other remarkable creatures. So on we journey, filled with wonder and awe, as we watch these remarkable Monarchs continue theirs. Farewell, little ones. We will watch for your children to return, even as we bring ours to this special place. Carman, I appreciate so much the "less obvious" parallel that you drew from the Monarch experience that we shared on Saturday. My desire for my children to have the opportunities for worship in the sacred spaces is a major driving force in my journey as a single parent. I am blessed to have such a supportive family and church family as myself and my children journey through life together. We do want the best for our children, and our longing in this area grows out of our own experience with the Divine, which we somehow know has been our own most valuable treasure. As for the butterflies, I find there is a lot to ponder in so many aspects of the world around us. 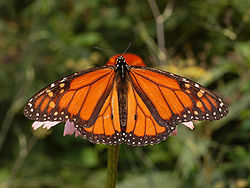 The Monarchs really are the most amazing of God's little creatures.